“I’ll like to say hi to my friends in family, they shall see us soon,” said an unnamed U.S. service member stationed in Niger, where an terrorist ambush killed four American troops in October 2017. Some airmen deployed to Incirlik, Turkey, were surprised with taped messages from their families. They were told they were going to do “holiday shoutouts” to their families, and when they sat down to record, they were presented messages from their families. Some were moved to tears. “Being stationed here in Qatar I was worried,” Air Force Master Sgt. Blue Etheridge, superintendent of the Joint Operations Center at Special Operations Command Central, told military journalist Sgt. 1st Class Tim Meyer. Sailors in Naples, Italty, deployed without family shared a Thanksgiving meal with a ceremonial cutting of the turkey by Adm. James G. Foggo III, commander of U.S. Naval Forces Europe. Troops also gave away free turkeys at military commissaries in Spangdahlem, Germany. “It’s an opportunity for our community to share and give back, especially during the holiday season when times can be tough, and we hope that providing these turkeys to families can help offset the cost of Thanksgiving dinner,” said Air Force SMSgt. Shannon Williams, first sergeant of the 52nd Communications Squadron. Troops in Spangdahlem also played “turkey-bowling” — with balls, not turkeys. Troops at Camp Lemmonier participated in a 5K run and a 3K walk. 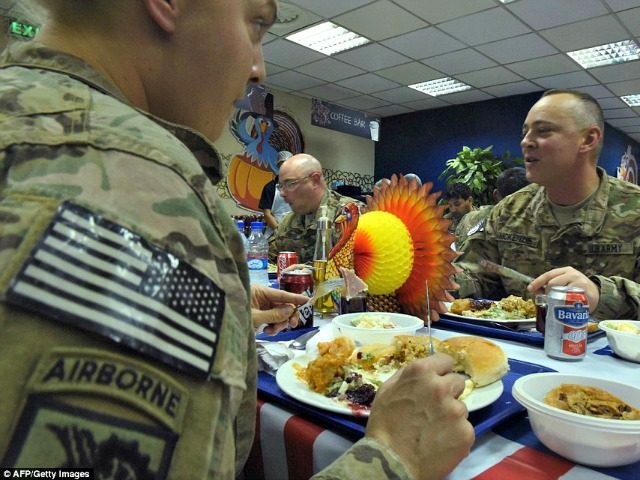 Defense Secretary Jim Mattis gave his own shoutout to troops deployed and working on Thanksgiving last week during a trip to the border. “I’ve got the troops deployed from Syria and Iraq to the Pacific. They’re out in the Atlantic. You saw that we just finished one of the largest NATO exercises, and the troops have just — the ships have just pulled into our NATO ally, Portugal’s port of Lisbon,” he said. “Rain or shine, light or dark, cold weather or hot weather — we have an all-weather force that’s on duty 24/7,” he said.